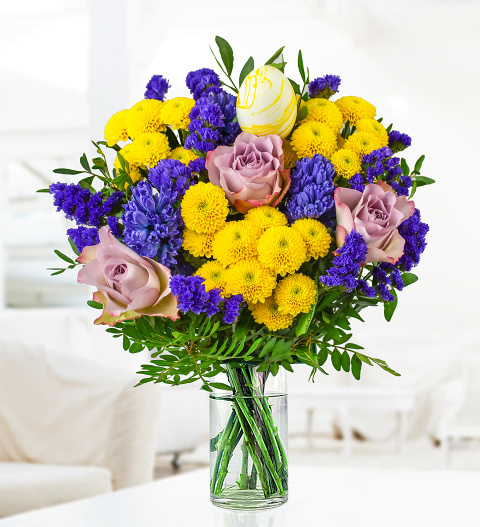 Fragrant blue Hyacinths, Memory Lane Roses and Statice pair beautifully with Lemonchello Chrysanthemums to create a bright and cheerful Easter display. With just the right amount of Pistache and an Egg pick, this flower arrangement is a true seasonal celebration. Send these Easter flowers to show a loved one that you are thinking of them or order them for your own home. This Easter flower delivery will fill any room with joy. Chocolates may contain nuts.